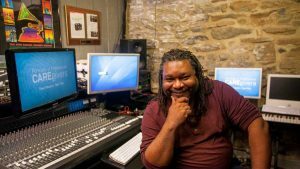 Rodney Whittenberg is an Emmy award-winning composer and an Emmy nominated filmmaker. He is the founder of Melodyvision, an audio music and video production company. His professional work, no matter the client, seems to center around social issues, community service, and political action. From the children’s CD “We Stood Up,” a celebration and reflection on the civil rights, to his latest film “Portraits of Professional Care Givers Their Passion Their Pain,” a look at the impact of secondary trauma of teachers/first responders/firefighters/police… Rodney’s passion for music and film is followed closely by his love of civics, history, and politics. As a lifelong creator of political music he always wished there was an outlet for contemporary political art. He and David are the perfect team to bring political music to the public.